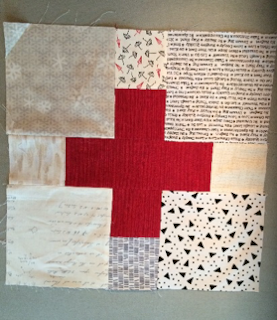 Charity Quilt Kits are a big hit. A kit includes supplies to make a quilt depending on the steps finished so far. A checklist is included listing the steps completed and the next chores to be done. You can pick up a kit that matches your favorite quilt tasks. For example: the bag may include fabric that needs to be cut into blocks and a suggested pattern. If cutting is a favorite part of quilting, you could cut the blocks, check that step off the list then return the kit for the next person. Another kit may include a completed quilt top that has been layered and quilted but is ready for the binding and label to be applied. If those are your favorite steps then we have another match! Nine Patch Blocks are also popular! A bin of 3” strips was provided for members to pick fabrics to make nine patch blocks. 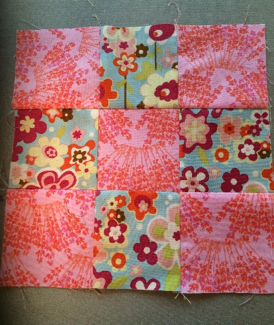 Using one dark strip and one light strip, cut nine 3” pieces and sew together into a nine patch block. It has been fun to see color combinations as blocks are turned in. We hope to have many blocks completed to make a number of scrappy quilt tops! If you have 3” strips leftover from your latest project and want to make nine patch blocks to donate, that is great too! Low Volume Plus Blocks are still being collected for a quilt top. A charity sew-in will be held on June 26th, noon – 5pm at the Penn Lake Library in Bloomington at 8800 Penn Avenue South. Anyone is welcome to come and help cut, sew, layer, make bindings, etc. Many hands will make work go quickly! BIG THANK YOU to all that have donated fabrics, batting, backs, orphan blocks, quilt tops AND COMPLETED QUILTS! Thank you to all that have completed blocks! 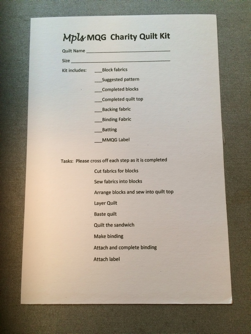 And another thank you to all that have picked up a quilt kit and completed steps toward the finishing of a quilt.